If you aren’t gluten-free, having fish and chips or onion rings while dining out probably seems pretty run of the mill, typical, not a stretch to obtain. For those of us who are gluten-free (especially for those of us for whom this is medically necessitated), having these foods out is a rarity. Enter Raglan Road. 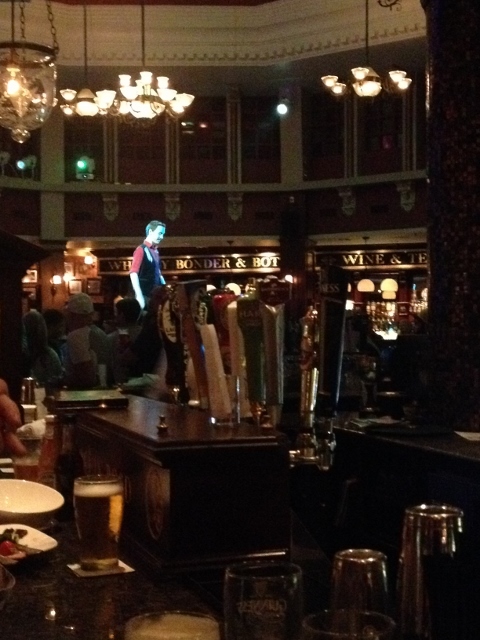 You may recall me writing about Raglan Road a few years ago, on my ill-fated trip to Disney. They were a saving grace then, serving up gluten-free onion rings that nearly made my cry tears of joy. My most recent trip was similar, they served up another terrific gluten-free meal. I was in Orlando for the Gluten-Free Living Conference. After the workshops and festivities concluded one evening, a group of us headed to Raglan Road. I dined with Shirley of Gluten Free Easily, Linda of The Gluten-Free Homemaker, Sarah of Celiac in the City, Andrea of Rockin’ Gluten-Free and Anna of Gluten-Free Jet Set. What an amazing group to spend an evening with. It was an absolute dream to share a table with this group of talented and fun gluten-free writers! We made the short trip from the Universal Studios area by car to Downtown Disney/Disney Marketplace. We had difficulty locating a parking spot. In all of my trips to Disney, we experienced some of the heaviest traffics and crowds I’ve ever seen. Once we snagged a parking space (and let out a loud cheer for the folks we stalked as they walked to their car), walking in the area wasn’t much better. It was absolutely mobbed! Raglan Road is an authentic Irish pub, built in Ireland, disassembled and plopped down in the land of Mickey. Gorgeous dark wood with gleaming brass trim, dim lighting and high-back booths create the feeling of being in Ireland, even though it’s in Central Florida. There’s open bar seating and tables aplenty. The space is divided into several smaller areas, creating a more intimate feel in what must easily seat hundreds of diners. We put our name in for a table at 9 PM at Raglan Road and were told it would be about an hour for a table. We headed to one of the two bars inside the Irish pub, passing by a stage with Irish step dancers and a live band performing. We had just received our drinks when the pager notified us our table was ready–it took nowhere near an hour! Our server, Murphy, was a card. He quickly tired of us attempting to make certain that everything we were ordering was absolutely gluten-free, cooked in a dedicated fryer, limited risk of cross-contamination. He suggested sarcastically that he didn’t want to hear “gluten free” again…so instead we took to using terms like “sans gluten,” hold the gluten” and “without gluten” until our order was complete. Two things on this: the staff at Raglan Road really are that comfortable with cooking gluten-free meals and those of us who are gluten free are really that uncomfortable with eating out. Perhaps both are justified. That’s really the lowdown at Raglan Road: Gluten-free onion rings, skinny chips, fish and chips and a few other breaded items can be made in their gluten-free batter and fried in a dedicated fryer which is housed in a separate prep area of the kitchen. Both times I’ve been here, I’ve asked lots of questions and asked for plenty of clarification. Both times the servers have been knowledgeable and I’ve had a safe meal. On this most recent trip, we asked a manager a few questions while waiting for a table. He assured us the servers are well educated and are quick to ask for a manager’s assistance if they need to. I ordered onion rings and garlic, parmesan and truffle oil skinny chips. 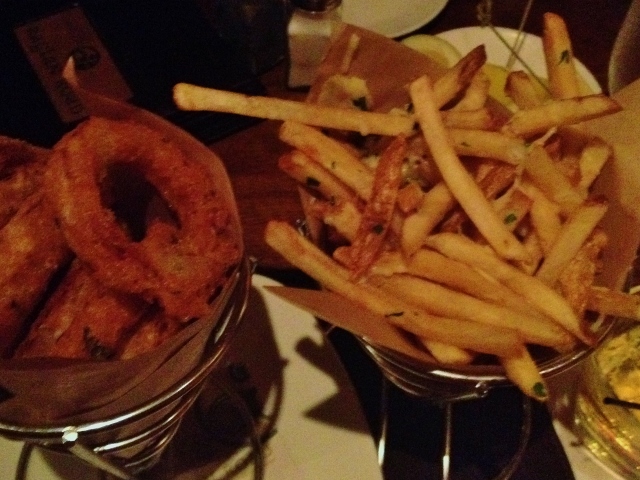 The skinny part comes from the thin cut of the fries, as opposed to the chunky chips served with their fish. Lest you think the skinny was because they were fried in Olestra or something. Also, please don’t judge my food choices. It had been 3 years and 2 months since I had eaten an onion ring. 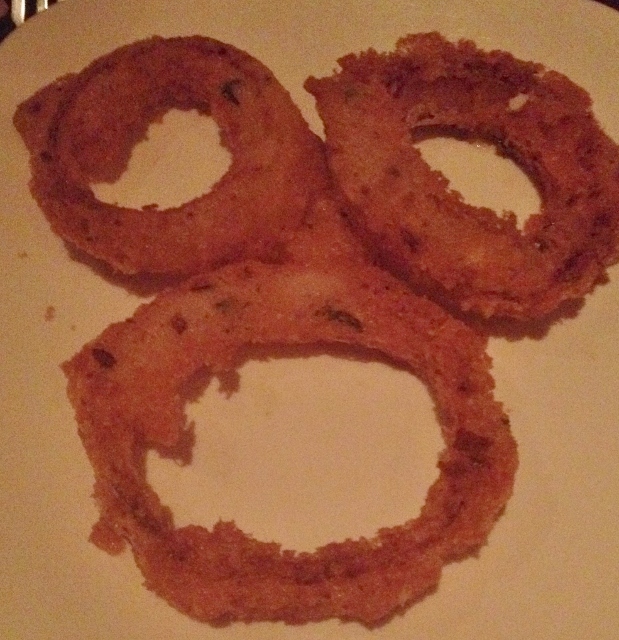 While it felt totally indulgent to order onion rings and fries for dinner, I have not a shred of guilt about it. And I also know it may be another 3 years before I eat such a meal out. Others at the table also had onion rings and a couple folks shared Fish and Chips. Sarah of Celiac in the City even said it was the best gluten-free fish fry ever. That’s a darned good endorsement, as she lives in the land of the Friday Night Fish Fry in Wisconsin. 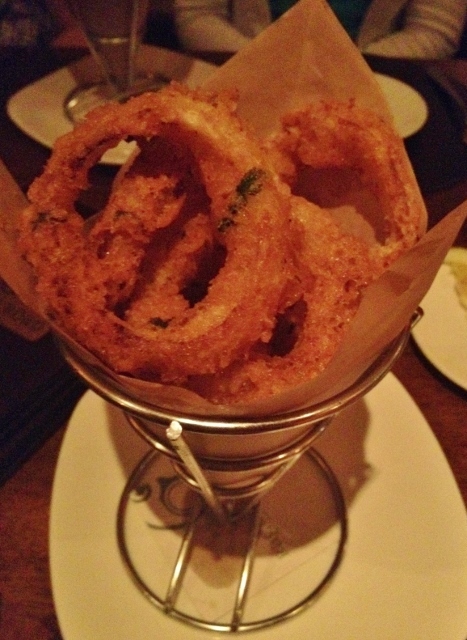 The onion rings are super crispy on the outside, not overly greasy on the inside. I had one onion ring and realized I was good at that point, my craving sated. But that didn’t stop me, since the whole order was there. I ate them all. While I haven’t tried other dishes, on both of my visits servers have pointed out many dishes that can be easily made gluten-free. Adjacent to Raglan Road is their counter service location, Cooke’s of Dublin. You can walk up and order gluten-free fish and chips or onion rings to go, or for take away as the Irish would say. They also have a quaint store, Shop For Ireland. On Sundays there is a Rollicking Raglan Brunch with an Irish Dance Show, as well as live music seven nights a week with hourly Irish Dance performances. Eat With: Moderate Caution. It can be quite loud inside Raglan Road. 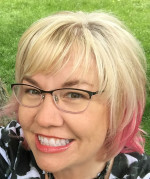 Make sure you have communicated your needs to the server and you get an acknowledgment back. Raglan Road is located at 1640 E Buena Vista Drive, Lake Buena Vista, Florida, 32830. (Otherwise known as Downtown Disney or Disney Marketplace.) 407.938.0300. This was such a fun night, and totally worth a once-in-three-years level of indulgence. Thank goodness I didn’t realize there was a takeout counter next door, or I may have left with more onion rings than I bargained for! I agree! A takeout counter is a temptation I would have trouble resisting. We’re not actually waiting three years, right!? What a fun evening: from the Irish dancers to the cold cider and the best company and conversation to those FRIES! (thank you for sharing, I’m still dreaming about them!) I’ll vouch again for the fish fry — it was actually one of the best I’ve had ever, GF or not. They’re doing things right over there. Such a fun, entertaining dining experience. I did not go the glutten free route, but it’s good to know this place makes accommodations for those who do. Thanks, Ashley! 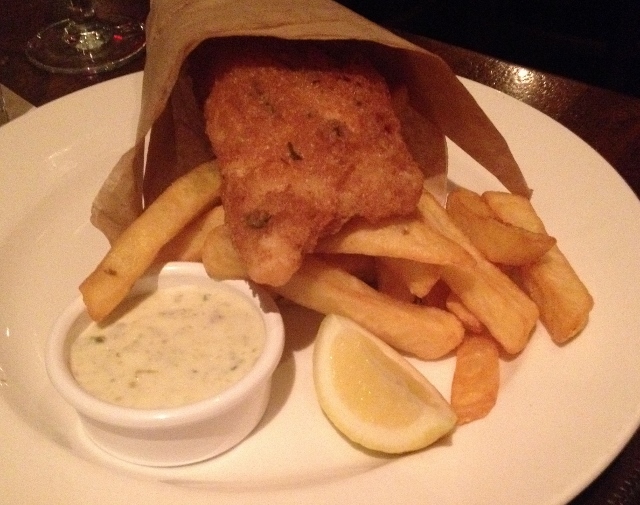 Raglan Road does a great job cooking for those of us who eat gluten-free by necessity!